I spotted Jill in the beginning of November sitting in the New Jersey Transit waiting area at Penn Station. 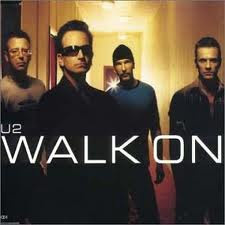 The one she shared with us is based on the song lyrics of U2 and their song "Walk On". The letter G and the date refer to her grandmother and the day she died, March 2, 2010. The lyrics are "And I know it aches/And your heart it breaks/You can only take so much/Walk on". Jill said that listening to music got her through a difficult time and this song, in particular, carried and sustained her through the mourning process. Coincidentally, March 2 marked the anniversary of her meeting the band in 2009. She chose an Edwardian script and the tattoo was inked by Mike at Fat Kat Tattoos in Keyport, New Jersey. Work from Fat Kat has appeared previously on Tattoosday here. 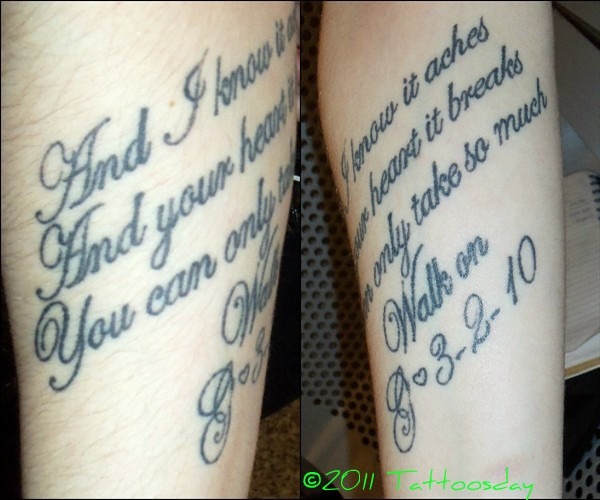 Thanks to Jill for sharing this special tattoo with us here on the site!